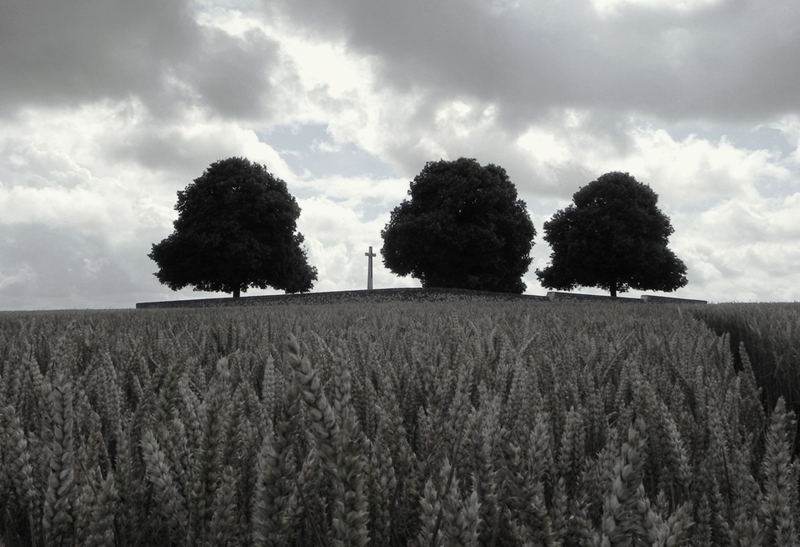 Last month I managed to stop in at the Arras battlefields when on my way down to La Boisselle for more site work. I only had a couple of hours before a lunchtime meeting in Peronne but still managed a quick recce for a private battlefield tour I am taking in September. I have some clients coming from New Zealand who have a relative, Corporal Andrew McDonald MM, who was fatally wounded at the Battle of Arras. I have been compiling a detailed report on this soldier who served in the 6th (Morayshire) Battalion of the Seaforth Highlanders. Derek Bird - "The Spirit of the Troops is Excellent." A first-class study of the battalion - highly recommended reading. Andrew McDonald was in the battalion from its very formation and arrived in France in 1915. As part of 152 Brigade, 51st (Highland) Division he served throughout the Somme offensive including Bazintin-le-Grand, High Wood and the successful capture of Beaumont Hamel in November. He was awarded the Military Medal for his part in a raid on enemy positions in September 1916 on the Railway Salient near Armentieres. 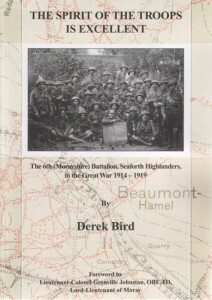 A most useful book on the battalion is Derek Bird’s ‘The Spirit of the Troops is Excellent’ which I can heartily recommend as a superb battalion study. On the opening day of battle, Easter Monday, 9 April 1917 the battalion was to be involved from the off. Facing the German trenches northeast of the small village of Roclincourt they were tasked with capturing three lines of German trenches, the third of which was designed the Black Line. They would then consolidate these whilst the 1/5th Seaforths passed through them in the ‘leap-frog’ system to take the next two lines, the Brown and Blue Lines. 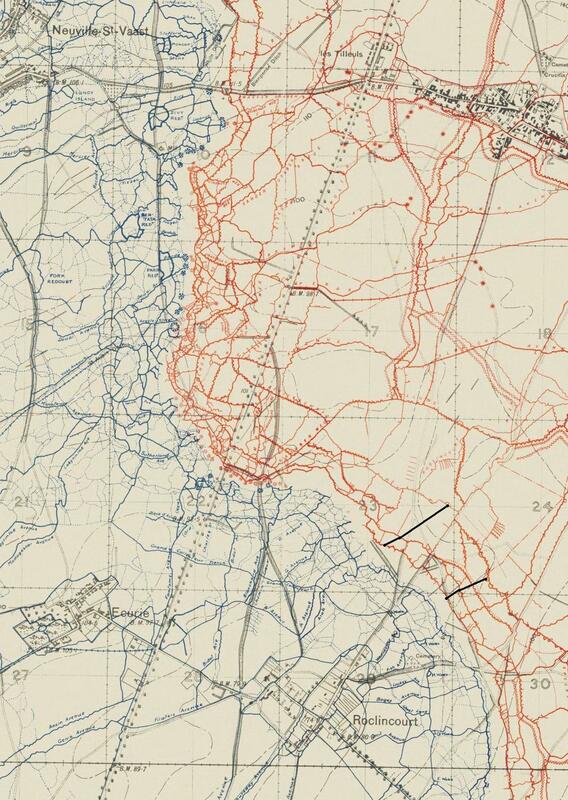 Trench map of Roclincourt-Neuville-Thelus sectors. The black lines are the boundaries for the 6th Seaforths attack on 9 April 1917. CLICK map to enlarge. Andrew McDonald was serving in C Company – they had even more limited objectives, being tasked with taking and holding a section of the first two lines. D Company with a platoon of B Company would then push on to the Black Line – the final objective for the battalion. As Andrew McDonald’s service record no longer survives it is very hard to know where he was fatally wounded and the war diary offers scant evidence. However, in September I will take his relatives, having travelled half way around the world, to the site of the jumping-off trenches occupied by C Company and let them stand where he stood on 9 April 1917. I am pretty confident that he was wounded in the fields in front of us, rising towards Farbus and Thélus on the southern shoulder of Vimy Ridge. The beautiful Highland Cemetery now stands close to the site of C Company’s advance. It is full of Highland Division men and is well worth a visit. 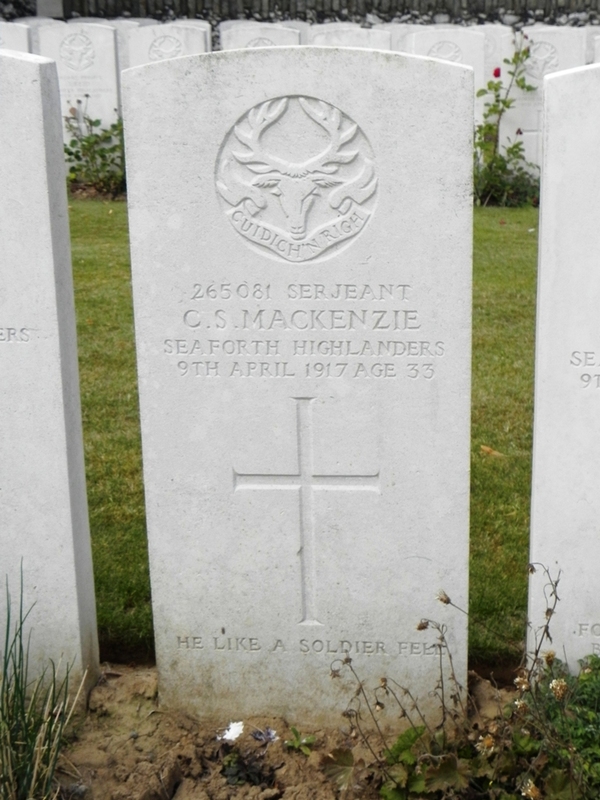 One casualty buried in the cemetery that particularly stood out for me whilst reading Derek Bird’s book was Sergeant Charles Mackenzie who was reportedly killed while engaged in a bayonet fight. One of his men was bayoneted and in a selfless act Mackenzie stood over his body to protect him from further wounding. Sadly he himself was then overcome and killed. Fatally wounded on 9 April Andrew McDonald succumbed to his wounds on 13 April, having made it back to the huge hospitals near Etaples. He is buried in the vast and sobering Etaples Military Cemetery, another spot my clients will visit on their September pilgrimage. Panorama overlooking Highland Cemetery. It is taken close to the site of the Battalion HQ during the opening stages of the Battle of Arras. The tree lined road on the left takes you to Thelus. All of this took place just off the A26 motorway so please spare a thought and look to your right and the lonely Highland Cemetery just past Junction 7 next time you are heading south.